“A mental states are mind made. The mind is their chief. If, with a pure mind one speaks or acts, “happiness follows him like the shadow that never leaves the owner” (Dhammapada). Paritta is a Pali term meaning ‘protection’ that refers to various formulae which are recited for protection or blessing. This term also denotes the collection of such texts as well as the ritual at which the collection of these texts or parts of these are recited. This ritual performed by the followers of ‘Theravada Buddhism’, is a complex religious rite with individual formulae appropriate for specific circumstances such as ill health, natural calamity, or the blessing of a new house. Monks chant the texts while holding a ritual string on their hands. This string is usually tied to various ritual implements, including a pot of water, before finally reaching the assembled people to whom the blessings of the chanting are transmitted. At the end of the ceremony, the ritually pure water is sprinkled and pieces of the thread are tied either around the neck or wrist for protection. The chanting of pirith, so popular today is used to exorcise evil spirits and to protect a person or society from evil influences and pestilences. This practice is a pre-Buddhist practice adapted to Buddhism. It is a magical rite taken into Buddhist ritual. The mandapa or the canopy, the water-pot, the sacred thread and incense are paraphernalia of magical rites (Sinha, 1953). 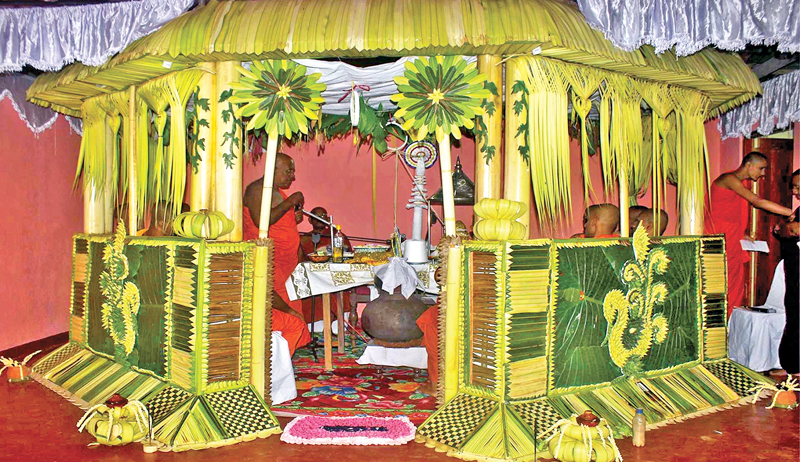 In Sri Lanka, Protective recitals are chanted by Buddhist monks and sometimes by lay people. Often their recitation is the most important script involved in an all-night religious ceremony. Protective recitals were promulgated by the Buddha. The Ratna Sutta was delivered by the Buddha to dispel a plague in the city of Vesali. The Khanda Paritta was taught as a protection against snakes. The Mora Paritta is a protection against enemies. The Dhajagga Paritta is an antidote to fear and terror. The Atanatiya Paritta that praises the virtues of the seven past Buddhas, is a protection against harmful influences. The Angulimala Paritta is a protection for pregnant mothers to ensure safe delivery. In The Questions of King Milinda, there is an important dialogue between King Milinda and revered Nagasena about the value and the significance of protective recitals. King Milinda asked, “If one cannot escape death either in the sky or in the mid-ocean or in a mountain cleft or anywhere in the whole wide world, then protective recitals are useless”. Revered Nagasena responded “The protective recitals are helpful for those who are of full age and who are free from an obstruction due to karma. No protective recital can prolong the life of one whose span of existence is coming to an end. Even if a thousand jars of water were poured to a dead and dried up a tree, it would not grow. A farmer guards the grain when it is ripe and ready for harvesting by preventing water from entering among the corn, but makes it grow by giving it water when the corn is young and full of life”. Revered Nagasena compares protective recitals to medicines that cure diseases. He further says that when a protective recital has been said, a snake ready to bite will not bite the club which robbers hold aloft to strike would never strike an enraged elephant rushing up would suddenly stop a great blazing fire would die outa deadly poison one had eaten would become an antidote or serves as food assassins would turn into slaves and a trap set to hold one would not hold him. However protective recitals would not be effective and protection due to karma because of an obstruction due to the defilements and due to lack of faith. Revered Nagasena stated that a naughty child would harm himself despite the mother's loving care. Generally, a pirith ceremony is followed by an alms giving ceremony to the monks. It is believed that giving food, endows long life, beauty, happiness, and strength to the giver as well as to those who receive it. This merit has been explained by the Buddha to the Kolian lady, Suppavasa who served the Buddha with various kinds of delicious food. Suppavasa was said to have been foremost among those female lay disciples who used to offer choice alms-food to monks. She was the mother of the arahant Sivali. Donations made to monks for example by providing food, clothes (robes) etc are believed to produce great merit. During the days of the Buddha there lived a wealthy financier called Anatha Pindika who constructed a monastery named Jetavanaramaya and donated to the Buddha. He was noted for giving alms on a lavish scale. It is said that he was reborn as a god after his death and later returned as the god to Jeetavanaramaya to praise arahant Sariuth in the presence of the Buddha (Ratnasiri, 2010). In Sri Lanka, pirith and almsgiving are traditional and conventional events organised on a very large scale during the Poya days such as the Vesak, Poson and Esala full moon days. Chanting Pirith and Alms Giving are meritorious actions (punna kriya) performed with good intention (punya cetana). The good intention continues to exist during the preparatory stage (pubba cetana), during the performance stage (mundane cetana) and after the performance whenever thinking of it with joy (apart cetana). The merit increase whenever the performer remembers the meritorious act. So, some individuals make use of electronic technology (audio-visual recordings and digital photograph albums) for assisting memory retrieval. The Buddhists believe that meritorious deeds yield happiness in the present life and the life to come. A pirith ceremony was planned, organised and implemented to bless a sick individual who was taking medical treatment for a kidney disease. A pirith canopy (mandapa) was erected by the local people using local young coconut leaves as decorative material. A new pot of pure water containing tender arecanut flowers was placed in it with a woven thread. On the first whole night a group of ten lay people chanted pirith and on the following morning pieces of the pirith thread were tied on the wrists of the gathering. The pirith chanters were served breakfast, well looked after and given cash incentives in the end. On the following day, ten Buddhist monks arrived in a procession accompanied by the drum beaters. The Buddha's Relics Casket (Karaduva) was brought on the lead with great respect over the head of the sick person's son. The Buddhist monks were invited into the house of the sick person after their feet have been washed and cleaned. Then followed the usual practice of observing the precepts by the participants and repeating the Buddhist precepts after a monk. First of all the Buddha statue was offered alms in a symbolic manner (Buddha Puja). At half past eleven, the monks were served with lunch. The serving of lunch was an elaborate procedure starting with king coconut water followed by oil cakes, kokis, ripe plantains etc and the main meal of rice and curry. Each monk was given an apple. Later salads were given followed again with king coconut water. Finally, betel was offered. After the meals, one senior monk read the agenda of the proceedings that followed. Then two very senior monks delivered two sermons blessing the sick person, the family members and the dead parents of the sick person. The merits of pirith and the alms offering were foregrounded in the sermons. Finally, the monks chanted pirith while the family members and the sick person poured water from a kettle to a cup that began to overflow amidst the pirith chanting. Ata Pirikara (robe, feeding bowl plus other utensils) was offered to the chief prelate, while other gifts were given to the other monks. Envelopes each enclosing a thousand rupee note was offered to each monk. The monk departed after the ceremony. They had to be provided transport and when they left they carried off the remaining food and sweets too. After their departure, the friends and the relations of the sick person enjoyed the lunch provided by the sick person's beloved wife. Later the digital photographs on various aspects of the pirith and the dane event showed to the gathering. The gathering comprised over fifty adults, excluding the children. Someone was saying that it was very costly and cumbersome to organise and conduct a pirith and dance ritual, that a poor person could not afford to do. On the whole, this was a successful cultural event. With adequate community participation. Whoever came to participate in this even brought some donation in kind (Curd and treacle, fruits, milk foods and locally made sweet eatables etc). Some participated in the activities pertaining to the event. In particular, the womenfolk who wore white clothes took part in the cooking and serving activities. However, it came to be known that there were two contractors who have to be paid for organising this activity. It transpired that the sick person had to pocket out around Rupees 200,000).